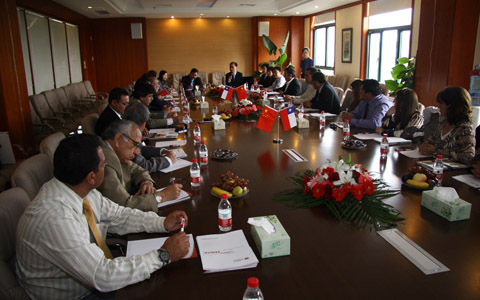 On 20th Oct, Chilean delegation visited headquarter and industrial park of SHANGHAI ZENITH MINERALS CO., LTD., they expressed strong interest in Zenith machines. Mining is the most important industries in Chile. After listening to the introduction of the development of Shanghai Zenith Company, the Chilean delegation most concerned about was whether Shanghai Zenith will set up an office in Chile. Shanghai Zenith Mining and Construction Co., Ltd. International Trade Department Manager, said: "Through the talks, we have a better understanding of Chile market and your sincere to build partnership with Shanghai zenith. We will seize this good opportunity and hope to accelerate the entire process through this communication"
When learned that the delegation from the mine accidents area in Chile, Shanghai Zenith leader said: "We admire and appreciate Chilean confidence and determination in rescuing trapped miners. The spirit is what Shanghai Zenith have been advocating and pursuing. " Furthermore, on the day before Chilean delegation visited, Shanghai Zenith Mining and Construction Co., Ltd. were invited to participate in the opening ceremony of "Latin American Express - Hong Exhibition Week," held in Expo Chile Pavilion. Chilean Ministry of Mines, regional government representatives and influential enterprises of major industry associations also attended the ceremony.